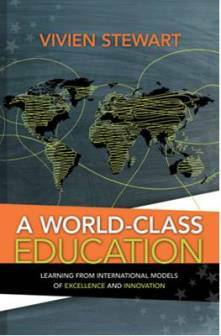 My reading this week was Viven Stewarts’s book, A World-Class Education: Learning from International Models of Excellence and Innovation. I found it interesting and would recommend it to you. Stewart examines various international education programs that are top of class currently or have made tremendous improvement in the past 30 years. She identifies why they were successful and how the approach is connected to the nation’s culture and what the US might learn from that success. What looks familiar to you? Ambitious Standards- High-performing countries have ambitious standards across the curriculum that are understood by students, parents, and teachers. Can your team define what students exiting your school will have mastered? Can you work backwards and identify each grade and course’s expectations. Can kids and parents tell when the standards are met? Commitment to Equity– Are the vision and standards for ALL? How committed is the team/staff to doing what it takes, developing multiple strategies and pathways so ALL achieve? High Quality Teachers and Leaders—Is your leadership clear on the current skill level of staff? What goals are being set for continued teacher/leader development? Are teachers engaged in planning their own development with goals and strategies? Alignment and Coherence– What are your implementation gaps? Where is your program or plan not being carried out? Where are you not “walking the talk”? Management and Accountability– What will be the roles of your leaders that provide the feedback all stakeholders need? I commonly meet leaders who feel PLCs are not being effective and when I ask, ”What the agendas and minutes show?”, I find they don’t exist or aren’t read by leaders. I meet principals who never ask teachers, “How are you using the instructional coach?”. What are the accountability questions your leadership team should be asking? Student Motivation– High performing countries employ both intrinsic and extrinsic incentives for students and expect more time on task than most American schools. Stewart states that it is the school’s job to engage and support students even when they may not initially be motivated to succeed. How does your school improvement plan look to increase student effort? How much of a professional model can your leadership create? Thank you for the recommendation! I have purchased and read the book, already feeling inspired for summer contemplation and shared thinking for leadership into the next school year. What I appreciate most are the variety of ideas and different systems and what we can learn from them – with careful consideration of differences. I am hoping to initiate a discussion in our school using the ideas presented as a framework – I believe that clear communication will be our greatest ally. My biggest inspiration comes from considering our goals and how we can create a collaborative professional community. We have an incredible staff but we are all working in different directions, with a lot of wasted effort for little gain. I believe we can make specific efforts to build understanding of why we are committed to equity and quality education for all, while considering our greatest strengths and challenges. Getting that common focus of student achievement outcome is the critical first step. Then what do we need kids to do. Then what will we do. Good luck, let me know what happens with you team discussions.